Medacta’s core philosophy is based on the belief that innovation is the key to success. 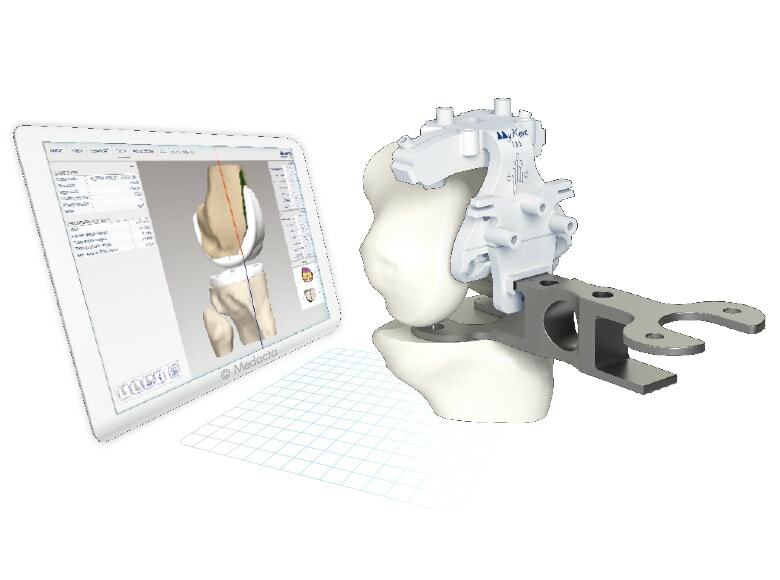 This leads to a constant effort towards the development of cutting edge solutions for Orthopaedics. 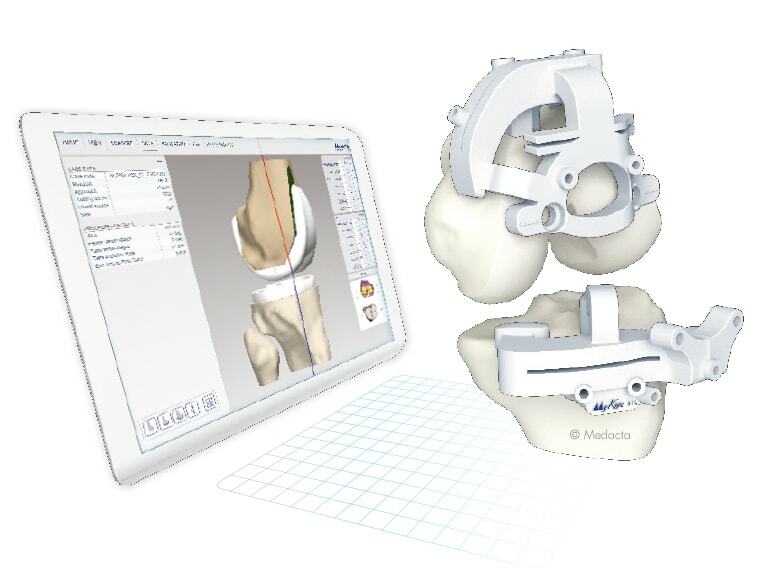 Unmistakable positioning: The MyKnee guides are positioned on the bone referring to distinct references: the osteophytes. Maximized visibility through the guides during both blocks positioning and resections. Telescopic alignment rod: The guides allow a drop rod to be connected, allowing you to validate intraoperatively the actual positioning and axial alignment of the blocks. 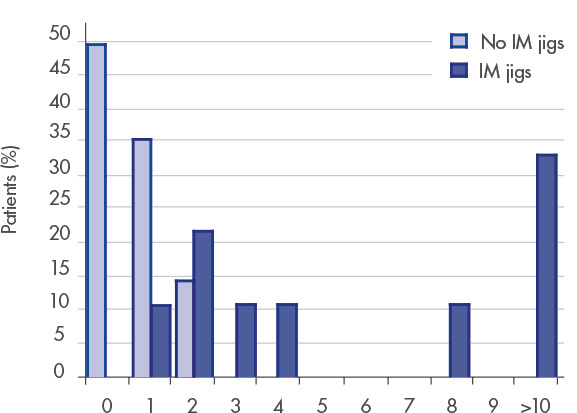 Emboli distribution as a percentage of patients operated comparing using IntraMedullary jigs with not using IntraMedullary jigs. 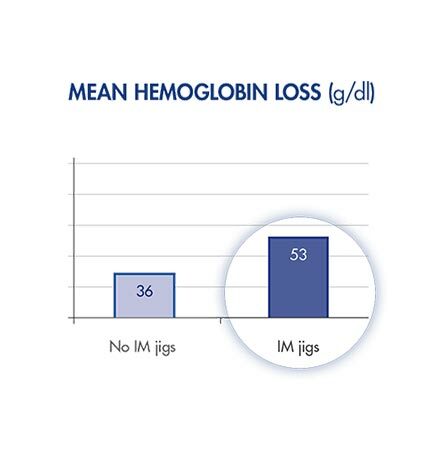 Having less blood loss allows the hospital structure and patient to save money associated with transfusions. Only 3 surgical steps are needed using MyKnee cutting guides: fit – pin – cut, saving more than 20 steps. Having a smaller number of surgical steps may reduce the overall surgical time, potentially adding one extra case per surgery session. Less exposure to the risk of infection. Only 2 MyKnee trays opened vs. 6 or more for a conventional TKR. Specific implants ready in the operative room. Less set-up time & turnover time. Less risk of losing and damaging pieces. Improved overall operative room logistics and efficiency. The user interface may change without notice. The picture is only indicative and shows the information provided by the interactive website. For every case the surgeon can modify all femur and tibia parameters such as femoral distal and anterior-posterior resection levels, femoral rotation, femoral flexion, femoral and tibial varus/valgus, tibial resection level and tibial slope. The MyKnee team is always at surgeon‘s disposal and is pleased to collaborate. 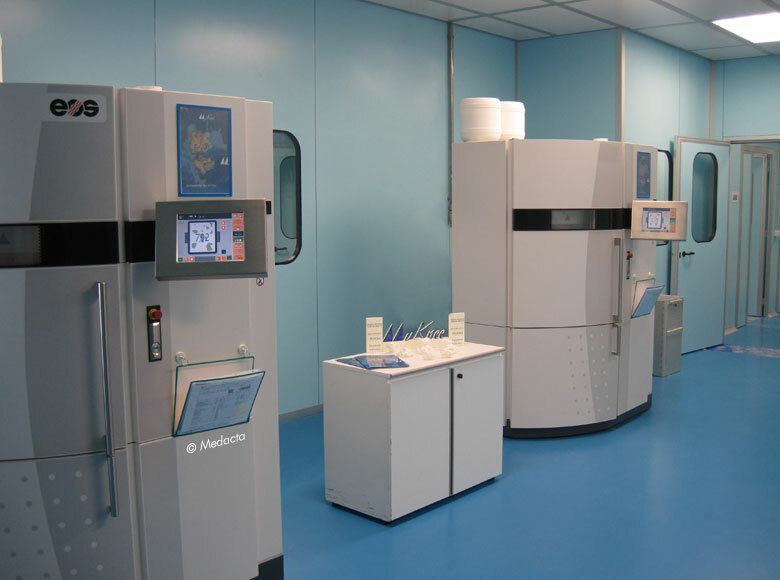 Once approved by the surgeon, Medacta produces MyKnee cutting blocks using in house laser sintering technology. The guides are then shipped to be setup for surgery. See Publication section to discover more. The bone resections are performed directly through the slots and all the checks can be done intraoperatively before pinning the cutting blocks. Freedom to choose the preferred imaging technology. 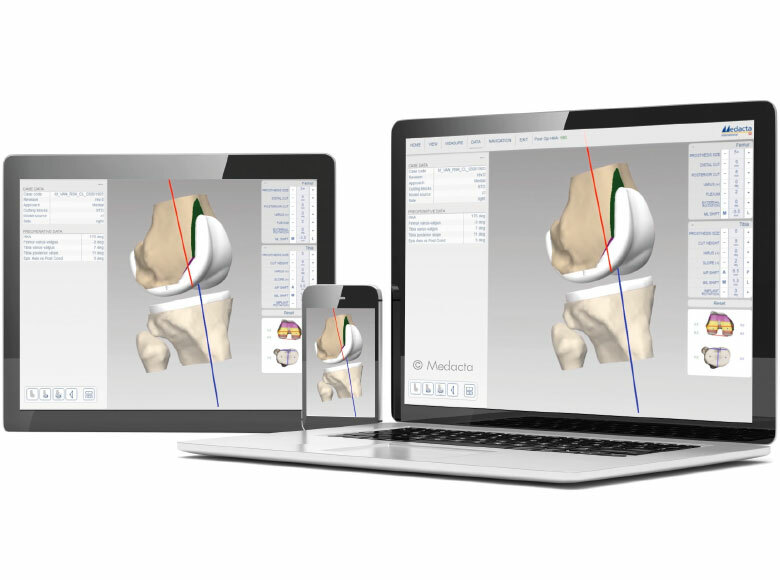 The MyKnee cases are managed entirely online, without the need of installing any software. The cases database is available to the surgeon at any time from everywhere and, moreover, the information on the website is always kept up-to-date. 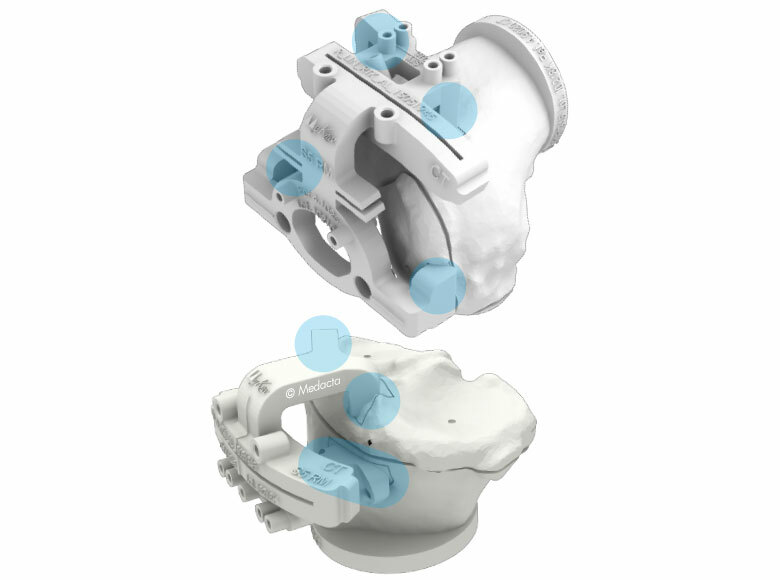 The MyKnee process is entirely kept in house from the 3D anatomical reconstruction to the cutting blocks manufacturing, allowing a direct contact between the surgeon and his personal MyKnee technician. The shortest delivery time in today‘s market for this technology. Each surgeon is assigned a MyKnee technician who is his reference person for all questions and needs. 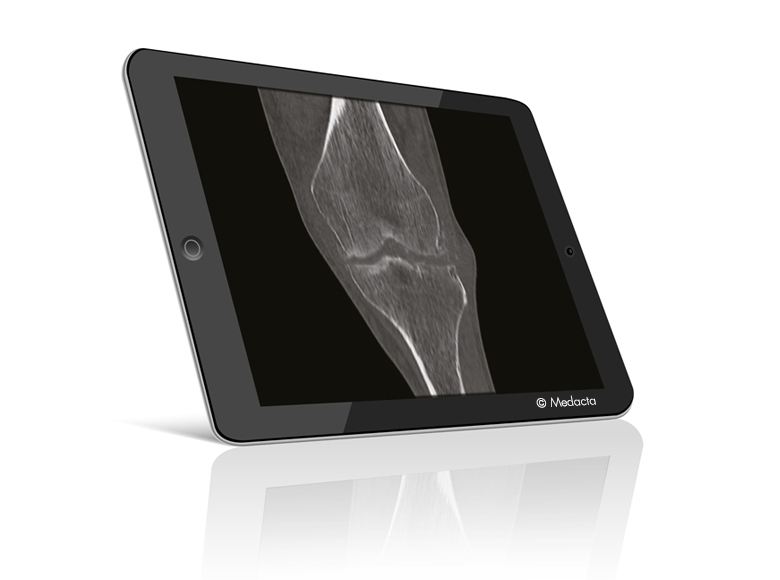 Medacta receives the CT or MRI images of the patient‘s leg. 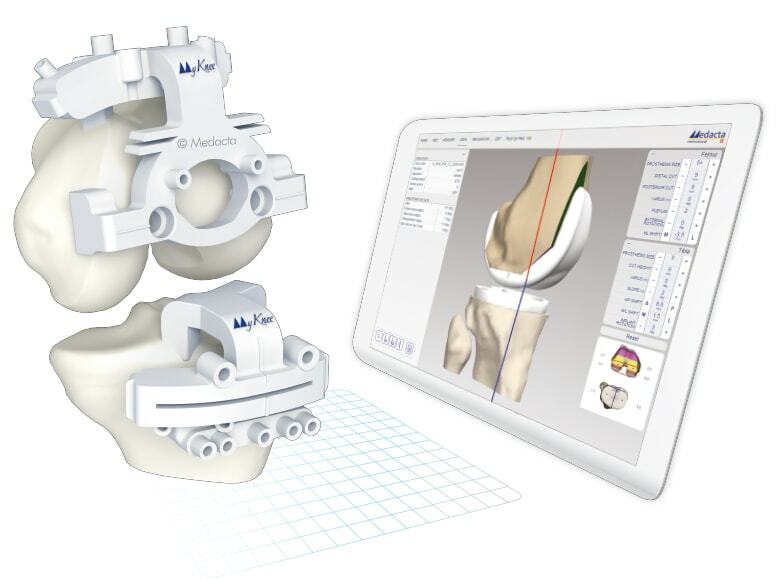 Starting from the 3D reconstruction of the joint and following the surgeon preferences, the MyKnee preoperative planning is performed. 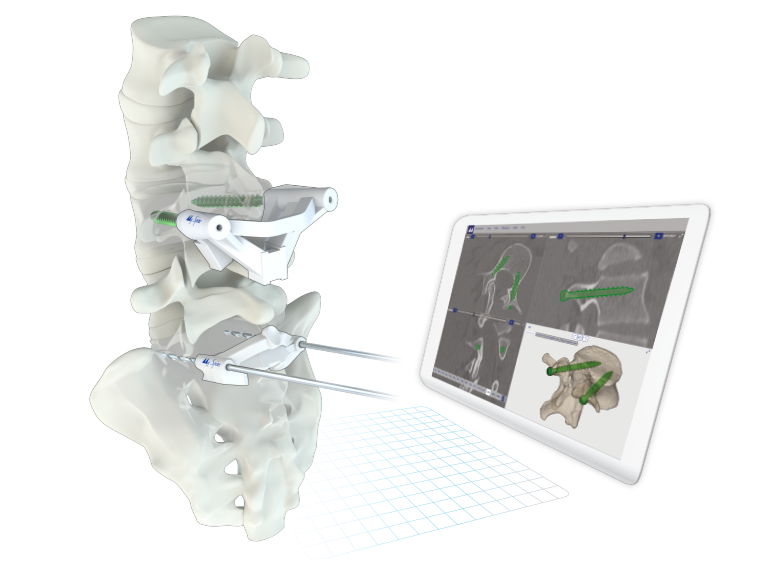 A virtual positioning of the implant is proposed to the surgeon who can modify the planning as he wishes. Once the planning has been validated by the surgeon, the in-house manufacturing process starts. Kalairajah Y. et al. Blood loss after total knee replacement: effects of computer-assisted surgery. JBJS Br. 2005 - Nov;87(11):1480-2. Kalairajah Y, Cossey AJ, Verrall GM, Ludbrook G, Spriggins AJ. Are systemic emboli reduced in computer-assisted knee surgery? : A prospective, randomised, clinical trial. JBJS Br. 2006 Feb;88(2):198-202. Peersman G, Laskin R, Davis J, Peterson MGE, Richart T. Prolonged Operative Time Correlates with Increased Infection Rate after Total Knee Arthroplasty. Hospital for Special Surgery Journal 2006 - Feb;2(1):70-2. 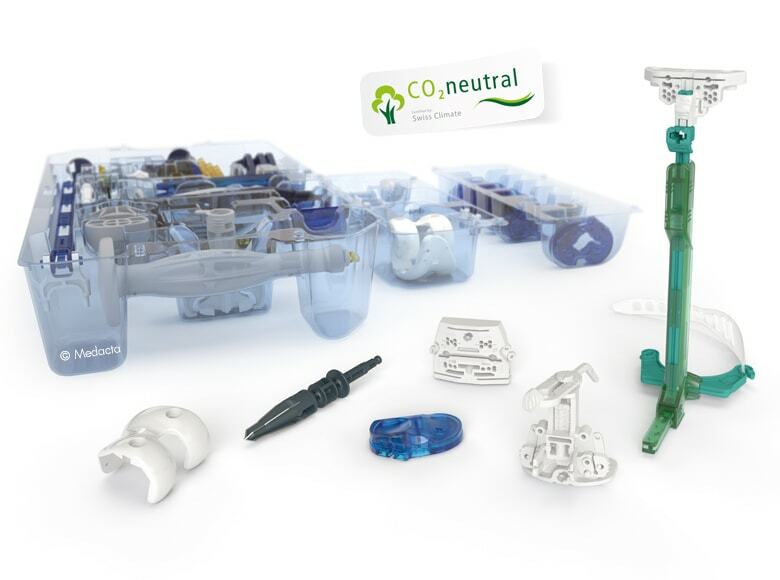 Leon V - Patient matched technology vs conventional instrumentation and CAS. Podium Presentation at the 6th M.O.R.E International symposium, Stresa, Italy, May 13-14, 2011. Baldo F, Boniforti B – Patient-specific cutting blocks for total knee arthroplasty: preoperative planning reliability. 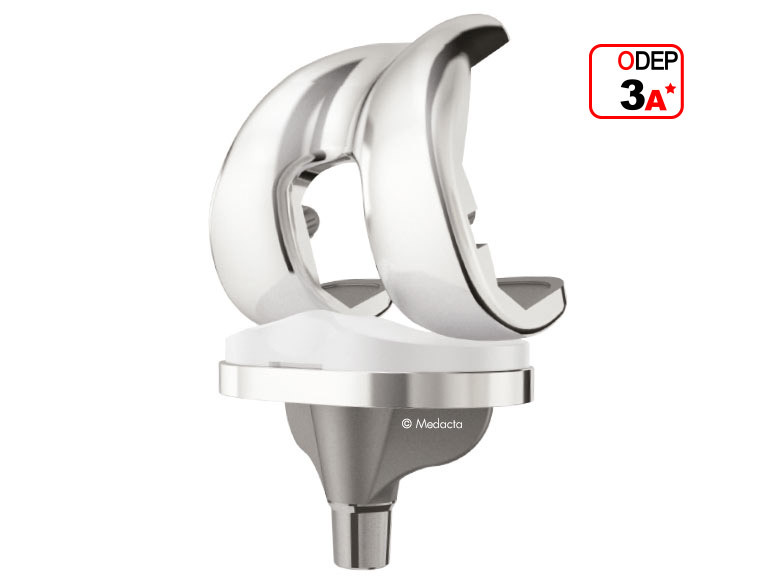 J Orthopaed Traumatol (2011) 12 (Suppl 1): S23-S88. Müller et al- CT based patient-specific cutting blocks for total knee arthroplasty: technique and preliminary radiological results. Podium Presentation at the 71st Annual Congress of the SSOT, Lausanne, Switzerland, June 22-24, 2011. Koch P et al- Guide de coupe sur mesure pour PTG : présentation de la technique opératoire et résultats radiologiques préliminaires. Podium Presentation at the 86th Annual Congress of the SOFCOT, Paris, France, November 7-11, 2011. 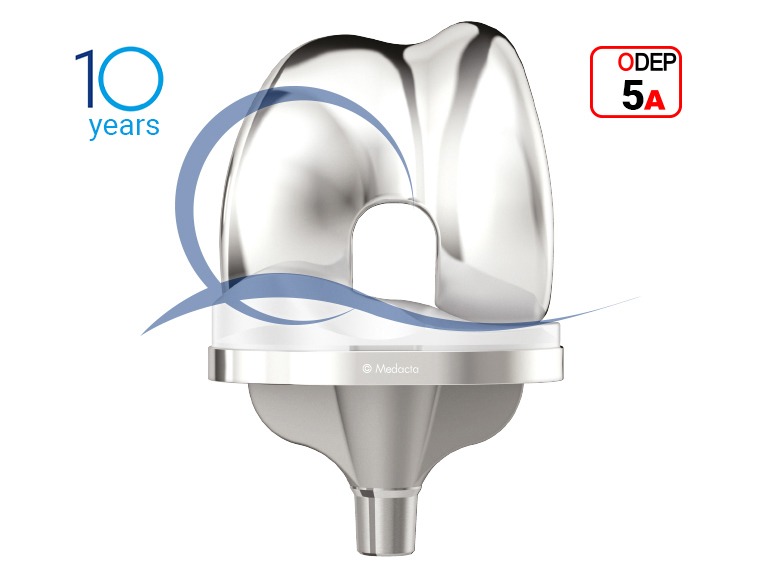 Koch P - MyKnee System : A new vision in total knee replacement. Leading Opinions - Orthopädie & Rheumatologie 2, 2011: 32-35. 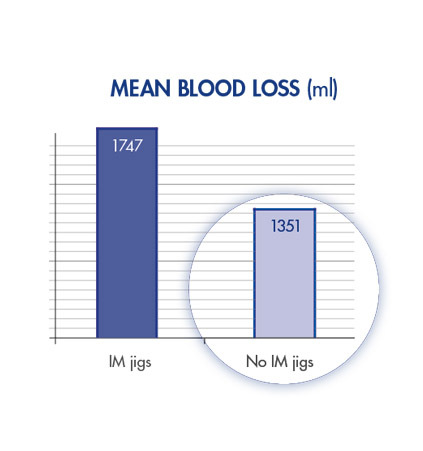 Goldberg TD - MyKnee economical and clinical results. Podium Presentation at the 6th M.O.R.E International symposium, Stresa, Italy, May 13-14, 2011. Dussault M, Goldberg T, Greenhow R, Hampton D, Parry S, Slimack M - Preoperative planning accuracy of MyKnee system. M.O.R.E. Journal 2012; 2:22-25. 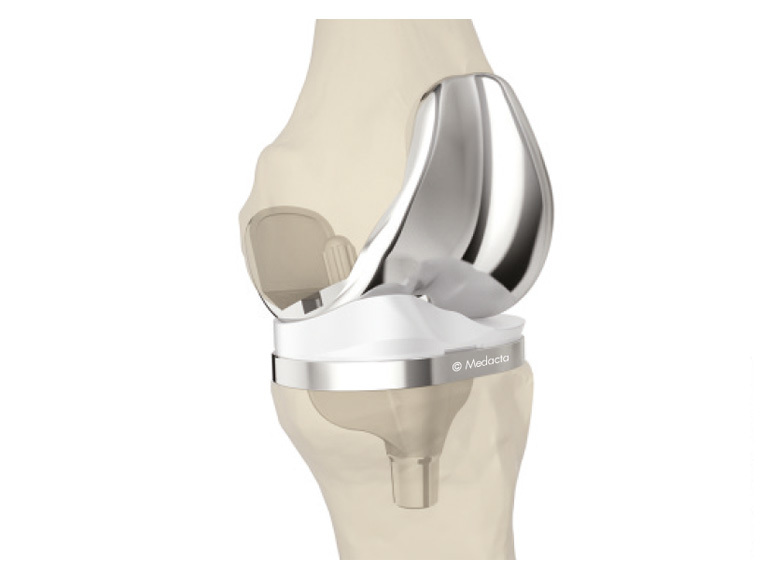 EXPERIENCE THE SYNERGY BETWEEN THE GMK SYSTEM AND MYKNEEMedacta offers you the opportunity to experience an anatomic knee replacement system with the enhanced accuracy and proven efficiency of a system specifically designed for each individual patient: this is the synergy between GMK system and MyKnee.